This article originally appeared in Cleveland Jewish News, Jan. 24, 2018. Ari Jaffe, of counsel with Kohrman Jackson & Krantz in Cleveland, began his law career as a “frustrated pre-med student” who wanted to work on health care, without the practical medical aspects. 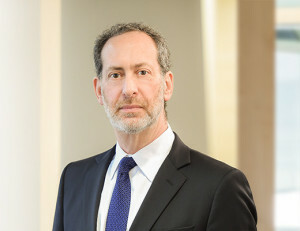 However, after working as in-house counsel for Blue Cross insurance company, Jaffe expanded his law repertoire when he changed firms, eventually landing at Kohrman Jackson & Krantz for the past 20 years and representing clients in high-profile cases, including those involving securities fraud, insurance, real estate and ethics. “I enjoy being of service to my clients, to the individuals and families and businesses I represent, to help them accomplish their goals and provide security for their families and their employees,” he said. In some such cases, he’s helped clients recover funds after being victims of Ponzi schemes, which refers to fraudulent investment operations falsely offering a low risk with a high payoff. For Jaffe, conducting quality research, gathering relevant facts and speaking to all knowledgeable parties to bring about fair resolutions makes up what he believes helps him excel in his role – which he said has been echoed by not only those he’s already represented, but by some unlikely new clients. “I have been hired by people who I’ve previously sued – which is a significant compliment and I enjoyed it,” he said. Jaffe also remembers starting out as a young lawyer and being concerned on his first day in federal court about whether a strict judge for whom he was interning would allow him to wear a kipah in court. Coming from an Orthodox background, it was important he was able to wear the kipah, but knew how strict courtroom dress code was. However, the judge told him it was “appropriate to wear a modest, small black kipah in court” – which he said he was “thrilled” about and still wears to this day. “It showed the respect that he had for the Jewish people and it showed the respect that he had for the law, and it showed a professionalism in a way that allowed all of us to express our religious beliefs in public,” Jaffe said, adding that much has changed as far as how religious beliefs are displayed publicly since then, but society at large has become more tolerant of diverse religious observance in public. “I’ve had the chance to interview jurors after jury trials and ask how they felt about my wearing a kipah, and I’ve found the responses are uniformly supportive,” he said. Along with acceptance of religious dress in court, another thing that’s changed over the course of Jaffe’s law career is the pace at which lawyers are expected to progress on cases. Responding to emails, conducting research and writing briefs all occur much faster.